December. The time of year Iceland is shrouded in darkness. Violent storms come raging in from the open ocean. Mountain passes fill up with snow. All the migrating birds have left. The island becomes silent. The perfect month for an adventurous elopement. We headed out from the city in the morning along the winding roads of West Iceland in complete darkness. Dawn still hadn’t reached us when we got to our destination at Hotel Búðir. There we met up with this amazing, friendly and genuine couple, Kaitlyn and Cory. We spent the rest of the morning hanging out at the hotel, talking about life, looking at a storm brewing outside the windows and on the weather forecast. Dawn slowly creeped in just before noon and with it came their celebrant, Árni. 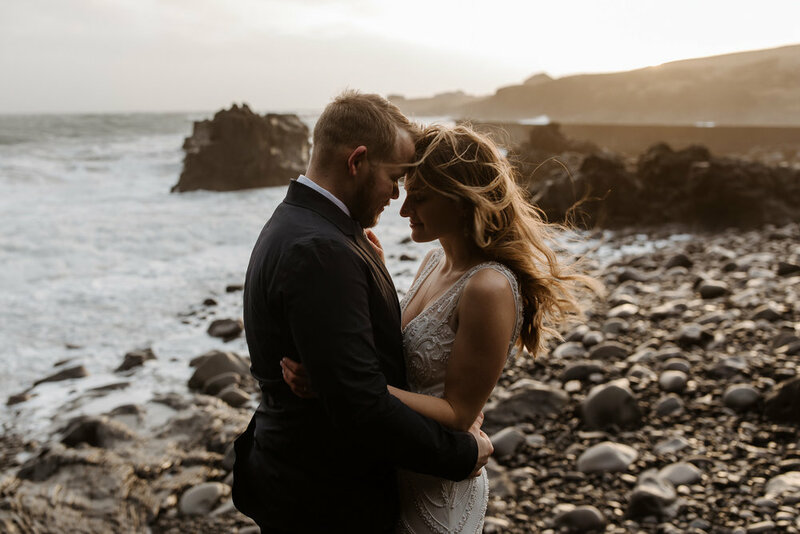 We had a long chat together about where to do the ceremony and it came down to two options: Stay in the comfort of the hotel or braving the storm in a little cove that we hoped would give us some shelter. 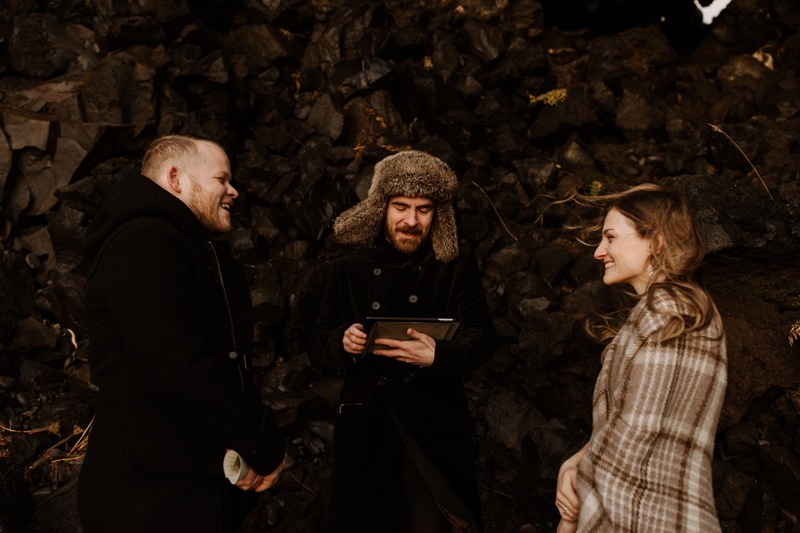 K&C didn’t come all the way to Iceland to get married in comfort so of course we braved the weather. It was definitely the right decision because mere minutes after we left the hotel the clouds parted just enough for the winter sun to bath everything in the most glorious, golden light turning the dreary landscapes in to works of art. Fortune favours the brave in Iceland. We weren’t completely wrong about the cove. After an intimate but still a little windy ceremony and a champagne toast to the sea, we used the three hour window of light we had left to play in the storm in a hectic dance with the fast changing light. Base camp: Hotel Búðir // Celebrant: Árni Grétar, Siðmennt Humanist Association.